The beauty of online advertising, unlike various other forms of advertising such as TV or radio, is that it is nearly completely trackable. When using Google Analytics as your platform, it is possible to see where website traffic has come from, whether it is from a paid ad on Google, Facebook advertising, an organic listing or referred from another website – the list goes on. There are parts of the online journey, however, where things do become a little hazy and it’s harder to track exactly what attributed to the final sale. For instance, online to offline sales and also cross-device customer journeys. Mobile searches are becoming more and more influential within the buying cycle, with 40% of smartphone users’ purchases being influenced by a mobile search, ie. 40% of users who do research on their phone go on to make a purchase. A huge 90% of people use multiple screens when spending money online, whether that be making a purchase or booking a service. Also, 87% do research online before entering a store to potentially make a purchase and 82% do research on their phone whilst in a store, looking at an item. This shows that mobile search can be extremely important within the buying cycle, even though it might not convert there and then. That person might visit your shop to complete their purchase or return to your site via desktop to buy. Either way, mobile still attributed to that sale. But how do we track this? Well, Google is now providing cross-device tracking within the AdWords interface so that advertisers can see how cross-device activity attributed to online sales. Google calculates cross-device conversions using its algorithm to compare the behavioural signals of a sample of signed-in users with a sample of non-signed-in users to estimate other occurrences of cross-device conversions. This information is then reported when Google is 95% sure that the data is accurate – a 95% confidence level. Advertisers can see this information by adding the ‘Cross-device conv.’ column to their AdWords data. According to Google “Cross-device conversions happen when a customer interacts with an ad (for example, by clicking on a text ad or viewing a video ad) on one device then converts on a different device or browser.” This allows advertisers to see how many conversions have been influenced by visits on multiple devices. 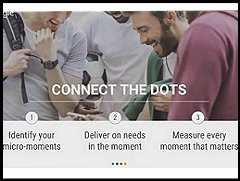 Google is always referring to the micro-moments, which are basically the important moments along the customer’s journey toward conversion. Google’s estimated total conversions across devices was an overall figure and insight into the many different forms of conversions other than just one-click purchases (ie. store visits, phone calls, downloads, sales), something it now refers to as ‘All conversions’. To find out if store visit conversions are available in your location you can ask your Google account manager. How does it work? It is based on anonymous, aggregated statistics created with modelled numbers using both current and past data on the number of people who click your ads and later come in store. This can’t be linked to individual ad clicks or people – Google uses industry best practices to ensure the privacy of users. The truth is that we will never be able to be 100% accurate when tracking customers or know exactly which ‘micro-moments’ helped persuade someone to purchase or sign up, but these latest developments from Google means we’re getting closer and closer. Ashleigh Brown, Head of Biddable Media at Browser Media Ltd, a specialist digital marketing agency. Born in 2005 as a search engine marketing agency, Browser Media still offers search as its core service but provides so much more than just tinkering with meta tags.